useful the treatment of category III bites of dogs, wolves and jackal. Being in liquid form it should be stored at 2oC to 8oC. It a solution of purified antibodies prepared from equine blood. Enzyme Refined Equine immunoglbulins . Category : Passive immunising agent . Indication : Treatment of category III bites of dogs wolves & Jackals. Dosage : 40 IU/Kg, body weight by 1/M or S/C route. Adverse Drug Reaction : Occasional sensitivity reactions acute anaphylactic shock which needs immediate treatment. 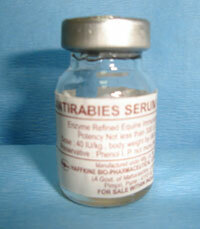 Equine Refined Equine Rabies Immunoglobulin 1500 I.U. Potency not less than 300 IU/ml. Antirabies Serum is of equine origin derived from the plasma of the horses, ponies, mules that have been hyperimmunized against rabies. The serum obtained from plasma contains purified, enzyme-refined and concentrated specific immunoglobulins. It is used as a passive immunizing agent and affords protection to the persons suspected of exposure to rabies. Each ml contains Enzyme-refined Equine Immunoglobulin Not less than 300 I.U. Phenol I.P. Not more than 0.25% w/v. Solution for injection by intramuscular or subcutaneous route. 5.0 ml per vial, 1500 I.U. For the treatment of category III bites for patients at risk being exposed to rabies after contact with confirmed or suspected rabid animal. It should be given as soon as possible after exposure preferably within 24 to 48 hours as it contains readymade antibodies. These antibodies confer passive immunity against rabies infections. It must be injected as soon as possible locally to permit direct and rapid in-site neutralization of positive virus. Antirabies serum alone does not guarantee an Antirabies treatment and should always be combined with Antirabies vaccination. Use with caution in subjects with a history of allergic symptoms to serum. In such cases, equine Antirabies serum is administered under medical environment that permits treatment in case there is an eventual dramatic allergic reaction. They are many immediate or delayed allergic type reactions. The observed immediate reactions are anaphylactic reactions with hypotension, dyspoea and unticaria.Delayed reaction consist of inflammatory reaction, fever pruritus rash o urticaria, adenopathy and arthralgias.Anaphylactic reactions can occur during and after the treatment even it the hypersensitivity test is negative. Anaphylactic reaction can occur even with the test. PRECAUTIONS TO BE OBSERVED BEFORE ADMINISTRATION OF ANTIRABIES SERUM. Eczema, drug all allergy from the patient. Whether the patient had received earlier, injection of serum such as ant tetanus serum , Antidiphtheria, serum snake Antivenin or scorpion venom Antiserum etc.